Lately I’ve felt the need to get rid of a lot of clutter in my life, both physical and digital and operate on a more minimalist spectrum. I’ve spent the past few days organizing e-mails, catching up on RSS feeds, and centralizing my files. 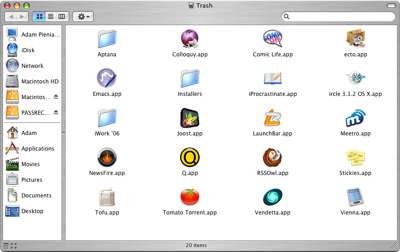 Let’s take a look at twenty of the Mac applications that I just tossed out. Why? Well, you know what they say. Oh you don’t, well you better start paying attention, they rule the world you know. So let’s see if there’s any hidden treasures among my trash! I prefer Aquamacs, though there is certainly nothing wrong with Emacs. Meh, AIM, facebook, twitter, and pownce are enough (in fact more than enough). I prefer Transmission though Tomato Torrents works fine Transmission seems to be faster and better organized. Quicksilver rules. Launchbar just did not seem to be as extensive or as intuitive as Quicksilver and thusly in this household we obey the shortcuts of Quicksilver! Joost is a great idea, but at the moment there is not enough good content to take up my hard drive space and time. Now that NetNewsWire is free I much, much prefer it to Vienna. While NNW was not free Vienna performed admirably but there’s just no need for it now. Looks cool but a bit beyond my league at the moment. Might go back and download this later as I learn more but right now it’s just clutter. See Meetro above. My geek status will lose points for not having an IRC client installed but I can live with it for now. Besides nearly everyone I know is on AIM or twitter so I won’t be losing touch with anyone. Cool but frivolous. In essence this program allowed you to comic bookize your photos by adding speech bubbles and comic book style actions. I didn’t use this once. I knew I wouldn’t when I downloaded it but I installed it nonetheless. No wonder I struggle to get things done sometimes. 30 day Trial I never deleted from when I got my Macbook Pro a year ago. This game looked really cool but also time-consuming and I just don’t have oodles of free time (contrary to popular belief, quitting your job does not give you tons of free time) to devote to learning the intricacies of this game. Yeah, I really just never needed this, see Aptana but much more so. Good idea but in the end it’s just another application that rarely gets used adding to my digital clutter. I use Devonnotes for all my note taking needs. It’s an awesome program btw. Didn’t really use stickies enough to comment on them one way or the other but it seemed functional. Cool program but don’t have the monetary flow to buy it right now. Anyone know any good free open-source alternatives? Any programs up there that I should give another try? I have Windows XP. Looking back, I probably would of gotten a Mac.. But I have found so many different XP programs that are exceptional (Notepad++ for coding, Microsoft Office for text documents & slideshows), I’m really happy with the computer I have. Hey to each his own Brad! I used Windows (including XP) for many years until finally breaking down and installing Ubuntu on my old main computer because Windows barely ran on it. I enjoyed the non-windows experience so much that when looking for laptops the Macbook Pro shot to the top of my list even though my previous Mac experiences were sluggish. I was actually worried moving from Windows XP to Mac OS X that I wouldn’t be able to find quality applications but the opposite is true, there’s a ton of great programs out there for Mac OS X. In either case, getting rid of applications every now and then is a good idea, especially if you have duplicates. Even though I got rid of 20, I still have 113 applications installed! Clearly I’ve got a few more apps to toss out. I’m an Ubuntu guy. I’ve been 100% linux for a few years now. I’m not saying its better in all areas but I never have to pay for any upgrades or programs (other than games) and it is so much faster for me to get work done its not even funny. All I have to say is for the Microsoft fans: Vista LOL! I’m a big fan of Ubuntu too. If I went with a non-Apple laptop, it’d be running Ubuntu right now. We’ve actually got all three major OS’s in my household. My mom runs Ubuntu, I run Mac OS X and my step-brother loves video-games so he runs Windows XP (many a time I’ve thought of secretly installing Linux on his PC). Yup, there’s two mid-20’s geeky guys in the household yet my mom runs the most geek-elite operating system in the house! That’s how easy and intuitive Ubuntu has become and it’s easily the best value out of the three operating systems. Yikes, I was thinking of replacing my Windoze laptop for a Mac when it dies (My desktop of course is Ubuntu and I totally won’t use Vista) but dude this is a foreign language. And I used to DEVELOP for Mac! Haha colleen. Those mac applications just keep exponentially sprouting up!